Cornell graduate student and Groundswell Board Member Mary Kate Wheeler spent 6 months in 2015 working in Peru collaborating with a local nonprofit, CARE Perú, to conduct surveys with 500 households in the Shullcas River Watershed. The region is rapidly changing due to climate change and that is having implications on food security and nutrition. Mary Kate was kind enough to fill us in on the work she did and we thought we’d share some of her story. GS: What have you been up to for the last 6 months in Peru? 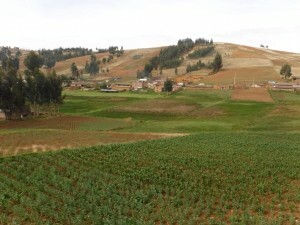 GS: What does farming look like in the Peruvian Andes? MKW: Farmers in the Shullcas River Watershed live between 3,300 and 3,900 meters above sea level, and their farming practices vary by elevation. At the lower end of that range they grow lots of maize, which is often accompanied by fava beans and modern varieties of potato. At higher elevations, farmers focus on traditional and modern potato varieties, along with other indigenous tubers including oca, olluco and mashua. Many families keep livestock for dairy, meat and fiber production, including llama, alpaca and the ever-popular cuy (guinea pig). In farming households both men and women participate in farm labor and decision-making. strategy to supplement a household diet that also depends on purchased foods. Most families rely on at least one source of off-farm income to make ends meet. GS: What kinds of challenges do small farmers face in the mountains? 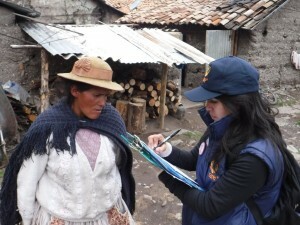 MKW: The interconnected challenges of poverty, food insecurity and malnutrition are a daily reality for farm families in the Andes. Remote rural households lack basic infrastructure to meet their health, education, information and financial needs. Low market prices and high transportation costs limit farm profits. 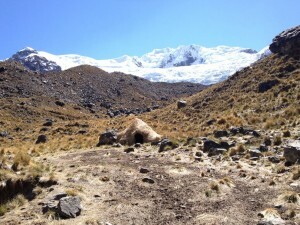 The climate is changing faster in the Andes than in many parts of the world, so farmers face high climate uncertainty and greater production risks. GS: What kind of education and support do farmer training organizations offer? MKW: Local nonprofit organizations provide education and extension services to build community capacity and support individual success in production and marketing. CARE Perú offers technical training through workshops, demonstration farms, farmer exchange visits and private consultations. Trainings emphasize climate-adaptive farming practices, including soil and water conservation strategies and the cultivation of native crops and varieties. CARE Perú also organizes producers to form farmer associations for specific products. Farmers in these groups share information and support each other to improve production practices, often with a goal of collectively marketing their products in higher value markets. GS: How will your results help farmer training organizations and others to better serve smallholder farmers in the Andes? MKW: Our research will help to explain why some farmers chose to adopt farm management practices that reduce their exposure to climate change impacts, while others do not. We will also explore important linkages between agriculture, food security and nutrition in our study area. While the analysis is still underway, we expect our results will help farmer training organizations like CARE Perú to better promote climate change adaptation among farmers. Our research will also inform the design of policies and programs that link climate adaptation in agriculture with improvements in household food security and nutrition.